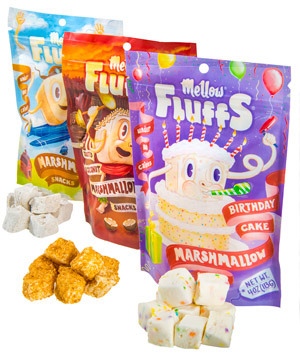 Mellow Fluffs Marshmallow Treats: Flavored marshmallow squares for snacking. 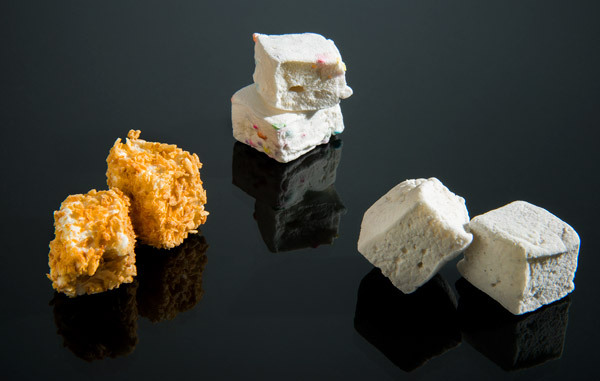 Marshmallows have been languishing for too long in snack obscurity, relegated to a mere supporting ingredient instead of the star of the show. 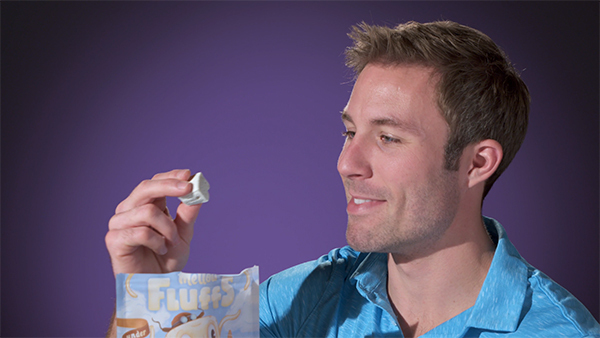 It’s time to bring the pillowy puffs into the spotlight by opening a bag of Mellow Fluffs Marshmallow Treats. These sugary squares pair the fluffy sweetness of marshmallow with a delicious bonus flavor. We dare say it’s impossible to resist a soft marshmallow mixed with Birthday Cake, Vanilla Bean, or Toasted Coconut flavor. With the added tastiness of these flavor enhancers, you’ll happily scarf down these mallows all on their own. If you’re the type of person who can’t make Rice Krispie treats without snacking on a few mallows, this is the treat for you. 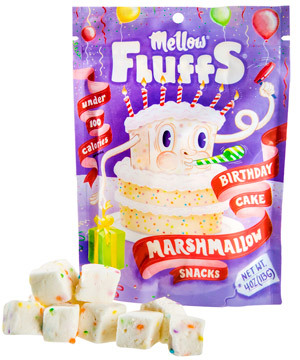 Mellow Fluffs have the soft sweetness you love in marshmallows with flavors borrowed from other desserts. The result is a piece of bite-sized sweetness you won’t be able to stop popping in your mouth. 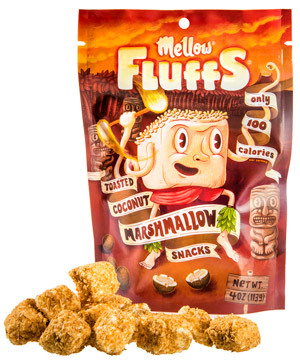 Mellow Fluffs are available in three flavors for your gorging pleasure. Try the classic sweetness of Vanilla Bean, the rich flavor of Toasted Coconut, and the colorful funfetti of Birthday Cake. Not only can you eat them plain, you can substitute them for normal (boring) marshmallows in your favorite snacks. Imagine these delicious flavors in your hot chocolate, s'mores, Rice Krispie treats, and other favorite recipes. Plus chubby bunny just got a lot tastier. Flavors: Birthday Cake, Toasted Coconut, and Vanilla Bean. Let's watch Danny and Eric eat some tasty Mellow Fluff treats! Eric and Danny enjoy some tasty treats made with Mellow Fluffs. Question: Can I toast them like regular marshmallows? 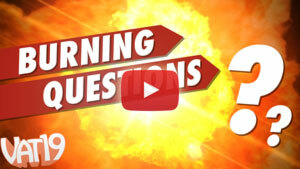 Answer: Yes (especially if you come prepared). 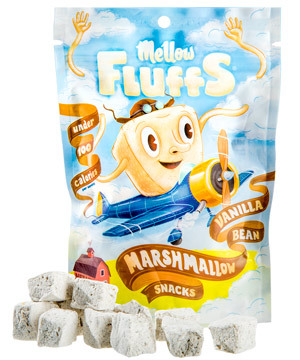 Mellow Fluffs can be used like non-flavored marshmallows. Birthday Cake: Sugar, Corn Syrup, Water, Candy Inclusions (Sugar, Rice Flour, Patrially Hydrogenated Vegetable Oil [Cottonseed and/or Soybean], Corn Starch, Cellulose Gum, Carrageenan, Titanium Dioxide [color], Artificial Color [Blue 1, Red 3, Yellow 5 & 6], Artificial Flavors), Corn Starch, Gelatin, Artificial Flavors, Salt. Toasted Coconut: Sugar, Corn Syrup, Toasted Coconut (Coconut, Sugar, Dextrose, Salt), Water, Gelatin, Flavorings, Corn Starch, Salt. Vanilla Bean: Sugar, Corn Syrup, Water, Corn Starch, Gelatin, Vanilla Beans, Flavorings, Salt.